Gov’t-World Bank Group joint report recommends reforms to foster private sector competitiveness, promote social inclusion and build modern institutions. A new report recommending steps to help lift Vietnam to upper-middle-income status in two decades suggests that Vietnam build a more competitive private sector, support smart urbanization, promote innovation, and take advantage of increasing trade opportunities to enact broad structural reforms. 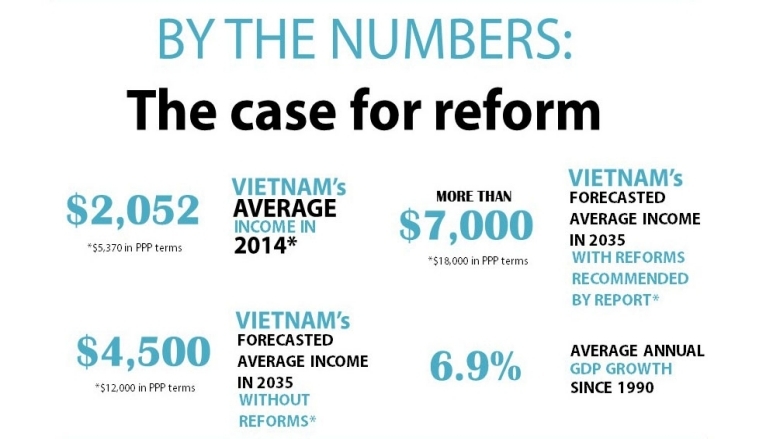 The Vietnam 2035 report, prepared jointly by the Government of Vietnam and the World Bank Group, lays out key reforms for the lower-middle income country to grow its economy, become more equitable, and put in place modern governance over the next 20 years. Reaching the ambitious goal of upper-middle-income status would require Vietnam to grow at least 7 percent per year, raising the average income level to over $7,000 – or $18,000 in purchasing-power parity terms – by 2035, compared with $2,052 – or $5,370 in PPP terms– in 2014. “In the last 30 years, Vietnam has become one of the world’s great development success stories, rising from the ranks of the poorest countries. On the strength of a nearly 7 percent average growth rate and targeted government policies, tens of millions of people have lifted themselves out of extreme poverty,” said World Bank Group President Jim Yong Kim. Kim said that the Vietnam 2035 report, with inputs from international and Vietnamese experts, reflects Vietnam’s aspirations of becoming a modern, industrialized nation within a generation. The agreement to work on the joint report was made in Hanoi between Prime Minister Nguyễn Tấn Dũng and Kim in July 2014. The report was produced by a joint team from the Ministry of Planning and Investment, the World Bank Group, and external experts from Vietnam. “Our country is at a turning point of reform and development. We face significant opportunities, but also big challenges. To reach our goal of a becoming a prosperous, creative, equal and democratic Vietnam, our only choice is to implement the reforms recommended by the Vietnam 2035 report. Without these reforms it will be hard for us to avoid falling into the middle income trap and lagging behind. We see these reforms as a continuation of the historic Doi Moi reform process and we believe current and future generations of Vietnamese people have the will, determination, courage and capacity to successfully implement these changes” said Minister of Planning and Investment Bui Quang Vinh. The report focuses on three areas: improving productivity and private-sector competitiveness; promoting equity and social inclusion; and improving public sector effectiveness. The report recommends Vietnam take steps to strengthen the economy and financial sector, with a focus on more effective regulation, protection of property rights and enforcement of competition policies. It suggests that Vietnam consider new policies and investments supporting the growth of industries linked to global supply chains, along with smarter use of major international trade agreements like the Trans-Pacific Partnership. Improvements to the agriculture sector – which employs nearly half the nation’s workforce – as well as stronger environmental protections and better planning for clean energy generation are also recommended. The report says that Vietnam can continue fostering social inclusion and equality by providing greater access to opportunities for minorities, people with disabilities and women, and providing services to an aging, urbanizing and middle-class society. Though Vietnam has made impressive progress on the inclusion agenda, ethnic minorities comprise half of the country’s poor despite being only 15 percent of its population. The report recommends governance improvements to help boost accountability and transparency, and ensure Vietnam has strong institutions to keep pace with the country’s rapid development. The report suggests adopting a more unified government structure that more clearly defines the economic functions of the state, reduces its role in direct production, clarifies boundaries between the private and public sphere, and employs and promotes staff based on merit. Another recommendation calls for Vietnam to strengthen state accountability by ensuring checks and balances between the three branches of government and creating opportunities for citizen feedback on public service delivery.